This is more than five stars read, no way I could do it justice with my review; however, I will endeavour. A Zimbabwean woman writes a letter to her daughter, Zenzele, in a university abroad, discussing issues (social issues) that affects us as Africans. It is an epistolary novel. She wrote about growing up in a racial segregated Rhodesia and the meaning of being an African woman. Also, about the African culture through the eyes of Europeans, how underestimated we are to them and how ignorant they are of our civilisation. Again, she expounded on interracial marriages, relationship to other westerners with African heritage and falling in love. Furthermore, she put in writing their fight for liberty, her relationship with God not the European God but God in her own image "dark-skinned Jesus and his Angels". Finally, she narrated about life in the village, there, lay their library and their encyclopedias. The lyrical, the romantic and the tragic that shaped them as Africans. "Rhodesia", named after a so called "Cecil Rhodes", was under the predominantly white government. Native Africans were banned from all manner of well being. They were forbidden access to the chick-European suburbs except, of course, they were to work as house maids. They lived in a state of constitutionalised racism that limited their education, laughter, play and pain. All they knew was deprivation, austerity and hard labour. Until, after years of bloodshed and struggles to obtain freedom, they regained their land and put up the name Zimbabwe that gave them the keys to the Kingdom of their country. Nevertheless, in the process of ensuring that their children received every opportunity of the "western privilege" something went wrong. "Well being" was translated into a material definition of success. They all wanted to be like their colonial master instead of cultivating their own culture. To her mother-in-law to be an African woman means be at peace within, to always listen to that inner voice and not let others take it away from you. To her mother it means to work hard. 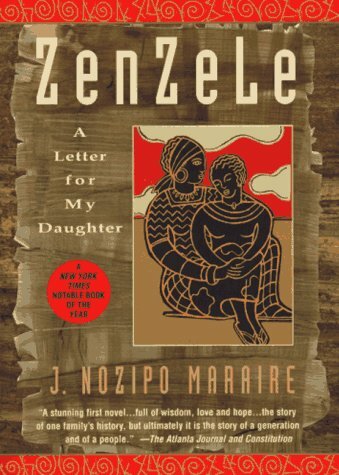 However, it is left to Zenzele to define herself as the African woman she wants to be. "Proud of what? of the mud huts? of the children running around in rags, playing with rusted tins? of coup after coup? proud of potholes in the streets, queues for sugar, buses that do not work? Is that what I am to hold my head high about?..........Poor beggars, we should be ashamed, not proud!.... the world most miserable excuse for a continent.....a cultural desert and a political swamp... and so on and so forth". He was told that he sounded like a parrot of the European anti-African jargon. "Our continent has no life, no definition, and no spirit of its own. It is an object to be acted upon. It needs to be molded, freed, bought, sold, aided, and sabotaged, all at the whim of the benevolent and all-seeing Europeans." As Chinua Achebe said and was also repeated in this novel "Until the lion learns to write, tales of hunting will always glorify the hunter." What a brilliantly written novel! Poetic, elegiac and lyrical, full of emotions, inspirations and wisdom. A must read and a re-read. In fact, I highly recommend it to all people of African heritage or simply to all lovers of African Literature. Actually, J. Nozipo Maraire is a Zimbabwean doctor, married with four children, a full-time practising neurosurgeon. She attended Atlantic College in Wales, received her undergraduate degree from Harvard University and went to Columbia University College of Physicians and Surgeons in New York City. And then completed her neurosurgery training at Yale. She currently lives in New Haven, Connecticut. Finally, I would like to say a big thank you to her for writing such a moving novel! With this I end my reviews for the year 2012! I will look for this book. Interesting review. The epistolary style reminded me of So Long a Letter; however, the content is different. Personally, I think the freedom-fighters were envious of the life the Europeans lived and therefore were seeking to become them. This is what led to the new form of slavery and oppression after independence leading to deep corruption. It's a sad situation. The worst of all is the loss of our culture. We are enamoured for everything Western. On a lighter note, I think medical doctor's make good writers. You said it right "enamoured for everything Western", I can recall growing up in Nigeria, I know quite a lot of people (African people) that refuse to speak to their children in our African language, they said it was too "archaic" and too "village style". Now as an adult I realise how sad that was. There is nothing wrong in speaking English but should they necessarily do away with their native language in order to do that. Please do look for the novel, I would like to know your opinion. Medical doctors make good writers? Do you know any that has published a novel? (African Lit). Hey Olawale, thanks for stopping by. Get yourself a copy, it is one of those books that worth owning. You will not regret it. I guess I will enjoy the novel more if I re-read it, there was too much emotion the first time. Wow! Very catching and inspiring story. I am glad that you picked such a lovely, creative and enlightening book for your review. Africa has rich values that we often neglect. Imitation has deprived us a lot of our creativity, therefore ravaging the beauty, peace and productivity that we would have otherwise had, if we remained original and creatiive. We shouldn't be proud of our huts and pot-holes but we should not succumb to corruption in order to become better than our neighbours. That way, we sabbotage ourselves. Lovely selection for review. Thanks for sharing, Mary. TC Thanks for the comment. To tell you the truth, novels like this makes me proud of being a blogger of African Lit. This is a letter to all children of Africa. Hopefully, I wish to review inspiring novels on my blog, but you know how this works, you never know what to expect until you are done. Thanks once more and Happy New year again. Excellent review, Mary and surely a must read for all. Absolutely, I highly recommend you to read it. It is my 2012 book of the year. Please do read it, it is so inspiring. I love the sound of the story. Hmm! You adding more books to my tbr. Geosi, Happy New Year. This is a novel I wholly recommend. Please, do read it. I would love to know your thoughts. Mary this is a great review, have to read this book now! Sis Diane, this is the type you would enjoy. I am sure. I loved your review and have read the book twice. I am considering giving this book as a gift to a mature, thoughtful, sensitive and spiritual African girl with a beautiful spirit who is a student of mine. She is finishing 8th-grade and is an avid reader; just like you, books are her passion. Unfortunately, she has experienced racism as an African in America, not just from white people, but also and especially from African-Americans. I was looking for a book that would be inspirational for her. I would love to give her this book, and have actually already bought it for her as a graduation gift from 8th-grade. My hesitation is that some of the language is so strong when the author is relating stories about racism. For example, she says that to non-blacks, black people are all "one burdensome color: black". And talking about Africa, Mukoma Byron says Africa is "the only landmass populated largely by blacks and the world's most miserable excuse for a continent". Those parts (and the other parts about racism) are painful to read. I don't know if that will be too much for my student at her age, even though she is very mature, or if she will instead be able to identify with the stories at some level and not be hurt by them, and will see the message that the author is trying to get across in each story. I know she would appreciate all of the description of African cultural values, the history of Rhodesia/Zimbabwe, and the wisdom of the elders, as well as the challenges of leaving one's "home" and trying to assimilate into a western culture. I am just hesitant about the language when it comes to black people and racism. I want a book that lifts her up and inspires her. Will those parts be too painful for her to read, or will she nod her head, thinking that that is how she has often felt too? I don't know, since my student's experience is not my experience. I guess I am asking hoping that you might be able to shed some light based on your experience, which might be a little closer to hers than mine is? One more comment, Mary. My student whom I would like to give this book to is 14 years old. speaking intelligently about. I am very happy I came across this in my search for something relating to this. Thanks for some other excellent post. The place else may just anybody get that kind of information in such an ideal manner of writing?